The GPS Debating Premiership competition commenced in 2002. 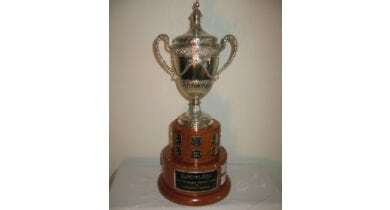 The Vicki Sargent Memorial Trophy is named after a remarkable woman who made an enormous contribution to GPS Debating. Vicki Sargent 1962 to October 2007. After attending Lourdes Hill and three years at teachers college, Vicki entered her first and final place of employment at St. Joseph’s College, Gregory Terrace in 1983. Vicki had passion for the Arts and for Education. This passion and competence established her as a leading Visual Arts teacher and in 2001 was appointed the first female member of the College Leadership Team – an achievement she was immensely proud of. Her vision for arts education and an unswerving belief in cultural pursuits for boys elevated Terrace to many artistic and cultural pinnacles over her time of directing the Visual Arts department and the Cultural programs at Terrace. It often takes a shock to make us see our lives afresh. In Vicki’s case the shock was the news, when she was just 30 years of age, that she had breast cancer. This, however, did not stop her, for she chose life and all that the world had to offer. No matter what it took – at Terrace, at Tennyson, at the theatre, at music assembly halls or classrooms, Vicki gave generously, lovingly, willingly and energetically; and in doing so embodied herself in the fabric of Terrace. In so doing she affected, not only the lives of countless young men in her care, but their families, her colleagues and indeed the teaching profession to which she was devoted. Her courageous fight to live saw her work right up to a week before her death. In the role of Director of Culture, Vicki has the responsibility of overseeing all co-curricular activities outside the classroom that was not sport. As well Vicki amazingly found the time to support the sporting programs by coaching both Rugby and Tennis. But it was her love of Debating, and the children from all GPS schools who chose to debate for their College that gave her incredible satisfaction and joy. Whether it was supporting every Senior A debate for the last 7 years; coordinating the vast array of debating coaches and arranging coach education for them all along with adjudicating qualifications; hosting GPS debates between member schools or hosting QDU finals nights at the College. Terrace’s fine reputation as a debating school has only been enhanced by Vicki’s extraordinary attention to detail and her unwavering sense of commitment to the program, students and coaches – and it must be said to the principles of the GPS Association. Vicki left an indelible imprint on not only individuals, but the entire Terrace family – and GPS family. Her influence has shaped the future of so many old boys and the memories we hold dear will never be erased. View the rich history of GPS Senior A Debating Premiers in the Trophy Room.